The information, directions, and tips presented here are in reference to a 1996 Ford Ranger XLT Supercab 4WD 4.0L AT with a 5.5” Superlift suspension lift and Rough Country Add-A-Leafs. After installing suspension lifts on Ford Ranger Supercabs (at least 93 – 97 body styles, though perhaps other styles as well), many owners experience drive shaft vibration, grinding, or other noises. This is due to the two-piece rear drive shaft. The two-piece drive shaft contains a short shaft, a long shaft, a carrier bearing (carrier bearing), and carrier bearing crossmember. The short shaft comes out of the transfer case and into the front side of the carrier bearing, which is mounted on the crossmember. The long shaft then comes out the rear side of the carrier bearing and connects to the rear differential. You should spend some time under your truck to familiarize yourself with these parts. There is naturally a stock angle that the short shaft and long shaft make when attached to the carrier bearing. The vibration you experience is most likely due to this angle being stressed beyond the limits of the carrier bearing. 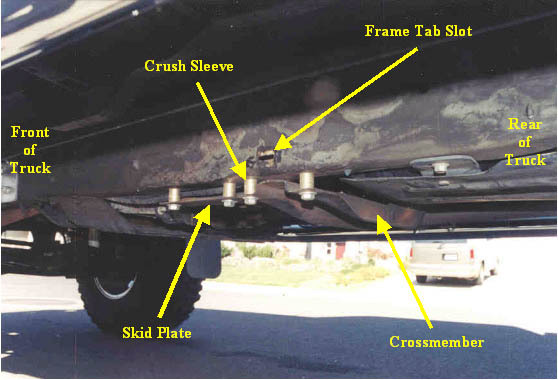 When lifting your truck, you are raising the crossmember and the carrier bearing away from the rear differential. Thus, the angle of the long shaft is steeper and is causing the vibration. There are two solutions to the problem: 1) get a custom, one-piece drive shaft; or 2) lower the carrier bearing and crossmember in an attempt to fix the angle problem. Solution one is preferred and results in a stronger drive shaft. However, it is at least 10x the cost of solution two. Note: The bolts all take a 5/8” socket (or wrench). Also, the bolts don’t need to be Grade 8 – regular grade is fine. Tuff Country Carrier Bearing Relocation Kit: PN ???? Note: The crossmember is attached to the frame with very thick rivets: two on each side of the frame. There is also a small, square skid plate that covers the rear ~12” of the gas tank. This skid plate is attached to the frame with two rivets and then to the crossmember with two rivets. Though not necessary, I strongly recommend that the skid plate be completely removed from the frame and crossmember. It makes the job much easier. Therefore, there will be eight rivets to remove: four on the crossmember and four on the skid plate. The process I had to use was to grind the rivet heads off and then drill out the rivet body. Some have used a maul and punch to remove the rivets after grinding off the head. I will only discuss the grinding and drilling method, since that is the method I used. 1) Pre-drill the rivets. Prior to grinding the rivets, drill a small pilot hole through the center of the rivet. This is made much easier if you use your nail set to make an indentation at the center of the rivet – this will prevent your drill bit from sliding off center. I learned this by trial and error. The first time I ground off a rivet’s head, I could not distinguish the rivet from the frame (as the rivet was now flush with the frame). I was forced to measure the opposite side of the frame to calculate where the rivet center was so that I could drill it out. 2) Grind off the rivets. Use your angle grinder to grind off the heads of the rivets. 3) Drill out the rivets. After the rivet heads have been ground off, use successively larger drill bits to drill out the rivets. When drilling out the rivets that attach the skid plate to the crossmember, be careful not to drill into your gas tank. 4) Remove the skid plate completely from the truck. The crossmember will now be very loose but still held in place by metal tabs that extend through slots in the frame (see Figure 1). Figure 1: Crossmember relocation, crush sleeves and frame tab slot. 5) Grind off the tabs. Use your free hand, clamps, or some other device to ensure that the crossmember is flush with the frame’s vertical face so that a maximum amount of tab is protruding from the frame’s tab slot. Then grind off the tab. Check to ensure that the maximum amount of the tab has been removed. Repeat for the other side of the crossmember. Reference Figure 1. 6) Remove the carrier bearing from the crossmember. The carrier bearing is mounted to the crossmember using just two bolts. These bolts were held in place with lock-tite on my truck and were extremely difficult to remove. It may be necessary to use WD-40 or another penetrating lubricant on the bolts – allow sufficient time for the lubricant to work. The bolts are threaded into a sort of clip nut. After removing the bolts, use a flathead screwdriver to remove the clip-nut from the crossmember and the carrier bearing mount. 7) Raise the carrier bearing. The carrier bearing should now be completely free from the crossmember. Use a jack stand to raise the carrier bearing as high as possible. This helps get the carrier bearing, long shaft, and short shaft out of the way, freeing up space to maneuver the crossmember. 8) Remove the crossmember. This requires some work. Even though the crossmember is free from the frame and carrier bearing, it can be difficult to work the crossmember out of the frame. This is where you will definitely appreciate having removed the skid plate from the crossmember. 9) Relocate the carrier bearing and crossmember. Use the six 2” bolts and the crush sleeves to mount the crossmember and skid plate below the frame (see Figure 1). Use the 1” bolts to mount the skid plate to the crossmember. Reattach the carrier bearing to the crossmember using the stock bolts and clip nuts. After performing the carrier bearing relocation, the vibration in my truck moved from the long shaft to the short shaft. Clearly, the angle between the carrier bearing and the short shaft was now too far out of spec. Therefore, I needed to raise the carrier bearing slightly. Do this by using the optional bolts and the washers to space the carrier bearing up away from the crossmember. 1) Remove the carrier bearing from the crossmember. Use the same procedures to remove the two bolts and the clip nuts that secure the carrier bearing from the crossmember. 2) Form new base for the carrier bearing. The carrier bearing is a rubber gasket/joint with a thin metal housing. It is this housing that has the metal tabs that the bolts go through; the metal housing allows the carrier bearing to be secured to the crossmember. However, the metal housing has no bottom. That is, the carrier bearing uses the mounting plate on the crossmember as the bottom. So, if you raise the carrier bearing away from the crossmember and mounting plate without constructing a new base plate, the carrier bearing will slowly fall out of the metal housing. Use the steel plate, your grinder, and the drill to form a suitable base plate for the carrier bearing to rest on. 3) Insert bolts and washers. This is guesstimation time. Thread the bolt (with a washer, of course) through the crossmember hole. Then stack 4-5 washers on top of the crossmember with the bolt threaded through them. Do this on both sides. Then put the steel base plate on top of the washer stacks threaded through the bolts. 4) Mount carrier bearing. Lower the carrier bearing onto the steel base plate with the metal housing threaded over the bolts. Tighten the bolts to secure the carrier bearing to the elevated mounting plate. 5) Adjust as needed. You may need to add or remove washers to fine-tune the placement of the carrier bearing. It took me two iterations to find the optimal place.